"One bath, one shampoo, and one simple way to show deep affection." Since — according to TripAdvisor — the Napa River Inn is considered Napa’s most romantic hotel, and we have a great set of claw foot bathtubs that would be the perfect location for this sensual delight, we decided to offer a set of instructions – guidelines, really – on how to undertake this gift of affection. Draw a warm, almost hot bath. Small drops of aromatic essential oils in the water will help create a mood of relaxation. 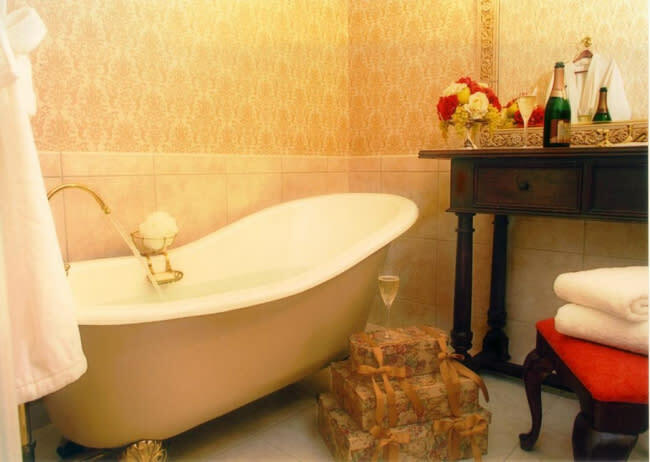 Allow your partner to immerse themselves in the bath, and relax while you pour the wine. Take your time; don’t discuss the day, the children, work, or other activities. In fact, you should start the light conversation with a compliment. Tell your partner something about them that you really love. Begin with the hair dry. Lightly comb it out. Once it is free from tangles, start by rubbing the oil in. If long hair, work on the dry ends and run your fingers through to lightly coat the hair. Move to the scalp; work your fingers from the hair line pulling gently to the top of the scalp. Rub, massage, and caress. Verbally ask if the pressure is correct. Adjust, if necessary. Once the hair is well coated, let it soak in the oil while you move the massage first to the shoulders, then the neck, and finally the face. If you have taken at least 30 minutes to massage, you can now move on to the shampoo. If the oil needs to soak in the hair a little longer, use remaining oil to massage your lover’s arms and hands. Use your pitcher to thoroughly wet the hair with deliciously warm water drawn clean, not from the bath. Your small hand towel can be used to dry water from the eyes, or to hold against the forehead so that water does not run into the face. If the face gets wet, kiss the lips before drying the water. Add the shampoo and mimic the same massage technique that you used for the oil: ends, middle, and scalp – continuing the scalp massage. Rinse with warm water using the pitcher. Once all the soap and oil has been removed, comb through gently with the wide-toothed comb. Finish the bath, and use one warmed towel on your lover’s hair. Loosen the hair and drape the towel across their shoulders. Use the other towel on their body, starting at their feet and working your way up.